They are the five questions that every budding journalist quickly learns, questions to get to the facts, to get to the story. I can see myself now – anxious and eager in my first week as a junior reporter, pristine notebook in hand – interviewing a woman in curlers on her doorstep after a fire at her neighbour’s house. A soft lad from the south in a strange northern town, my beginner’s shorthand wasn’t up to the job, my ear wasn’t yet attuned to the accent. But I kept plugging away at my questions and got there in the end. 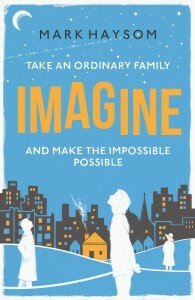 Follow Nanna, Christie and the children in IMAGINE. I spent the next few years asking them all the time: who? what? where? when? why? And perhaps that’s why then, these decades later, they are the same questions I spend my days still asking. Not now to get at the facts, of course, but to create a world of my own, to pull a story from some dark, mysterious place in my head. Because they are they are the novelist’s questions too. But I tend to ask them now – ask them of myself – in different sequences. What? I might begin with a single vivid scene. It may have been prompted by something drawn from memory, or, perhaps, something I’ve read or seen. In my new novel, IMAGINE, it was a student being summoned suddenly from a lecture theatre; something from my own long ago time at university. I let the scene play in my head, over and over, see it begin to take on a life of its own. He hangs his head; he stumbles along a row of other students; he’s troubled. I ask the same question again and again: what? What exactly is happening here? What does he feel like? What are other people in the room thinking? Where? Once I have that scene, I locate it precisely. In my mind. I look around the lecture theatre, describe it to myself until it becomes familiar, until I feel comfortable there. I keep asking the same question: where? Where exactly is he sitting? Where is the lecture theatre? In which university? In which city? Who? It’s only then that I move on to the most important question of all. Who is this student? What’s he like? What’s his story? Who are the people who are important to him? I begin to assemble my cast of characters. When? I locate it in time. When did all this take place? At what time of day? In which year? In IMAGINE, it’s 1973. What was the world like then? What was happening? Who was important? I read, research, immerse myself in the era. Why? And somehow by the time I reach this question, I find I am able to answer it, a plot is beginning to emerge, a story is taking shape. I know why he is being summoned from the lecture theatre. I know who has summoned him. But why did they do that? What’s the mystery here? What’s the surprise? The shock? And then I move the story on again. Meeting new people along the way, visiting new places; asking all the same questions, in different sequences, time and time again. A thousand small questions. More. And only when I know the answers well enough, do I begin to write.